SlotoCash Casino has been online since 2007 and has earned a reputation of being one of the premier online casinos for USA players and players worldwide. Powered by the award winning Real Time Gaming casino software SlotoCash Casino prides itself on fast withdrawals, generous free money bonuses and excellent customer service. SlotoCash Casino Deposit Methods: SlotoCash Casino has added Paste and Pay Vouchers to the cashier available only after registering. You can also deposit with Visa, Mastercard, American Express, WebMoney, Skrill/Moneybookers, NETeller, ECOcard. SlotoCash accepts deposits made in USD and Euros. The minimum deposit amount for credit cards is $20. SlotoCash Withdrawal Options: WebMoney, Skrill/Moneybookers, NETeller, EcoCard, Wire Transfer. The minimum withdrawal amount for a wire transfer is $350. SlotoCash does not charge any fees to withdraw. Visit the cashier or contact live help for more details. 200% First Casino Deposit Bonus: SlotoCash Casino will give new players 200% more in free bonus money on their first deposit up to $1500! After registering as a real player redeem coupon code in the casino cashier before making deposit. There is no maximum cashout. $7777 Deposit Bonuses: After you claim the first 200% bonus you can claim 4 additional deposit bonuses for a grand total of $7777 in free bonus money. Make sure to redeem the coupon code in the cashier before making a deposit. There is no maximum cashout with this bonus. Visit the SlotoCash Casino promotions page for details and bonus codes. Claim 25% Cashback on any Lost Deposit: If you deposited and didn't claim any bonus contact LIVE CHAT and claim your cashback bonus! Its that simple! As with most casinos these days bet size may be limited on slots and table games when claiming a bonus. If you don't take any bonuses you can bet any amount. Always take a few minutes to read all the bonus terms and general terms and conditions for any casinos you play. Tip: Never open a second account or you will be banned from playing whether in free mode or real money mode and void any winnings. Signing Up: Joining SlotoCash Casino whether to play for free or with real money is straight forward. You simple download and install the Slotocash casino software, fill out a short registration form and start playing. SlotoCash supports the following languages, English, French, Russian, German and Italian. You can also register and play the no-download flash casino version available on the SlotoCash home page. We always install the downloadable version as we think it runs better. The choice is yours. Once registered, you can play for free or switch to real money play anytime. Comp Points: When you register you're automatically entered into the SlotoCash Cash Points program where you accumulate comp points every time you wager on a game. Later you can redeem the points for some free bonus money. Documents: Like all casinos, even land casinos you'll need to produce some form of id. While you can still make quite a few deposits without submitting them you'll definately need to fill them out to withdraw winnings or to lift any deposit limits. The forms are pretty basic and you can email them to support. If you don't have a scanner simple fill them out and take photo's using your digital camera. They just need to be legible. 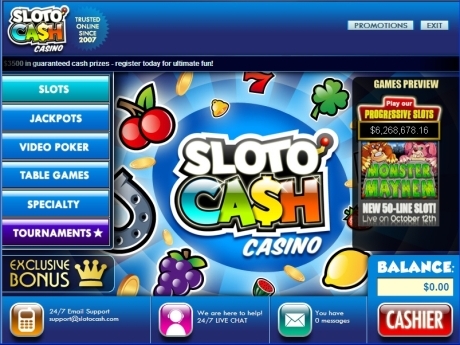 SlotoCash Casino Lobby: You can access all features offered by SlotoCash from the casino lobby. The games menu is displayed on the left with the game line up listed by category. You simple click or mouseover a category title to display all the games available in that category. A screen snapshot of the latest game release is displayed in the Game Preview window. If you mouseover the name of the a slot game the Game Preview displays a screen image of the game along with specific details like paylines, coin size, maximum jackpot etc. On the top of the casino lobby are your exit button and promotions button. Click the promotions button to see the latest bonus promotions. 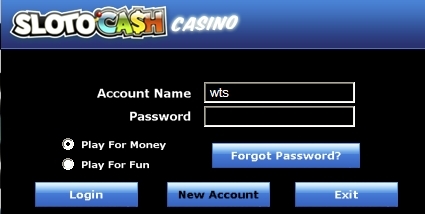 Click the exit button when you want close the casino software. A ticker scrolls across the top with the most recent winners and special promotions. The balance window displays your current bankroll amount. Your bankroll consists of any unwagered money and bonus money. The bottom of the lobby include buttons to contact email support or launch live help. The messages button displays any special or new promotional offers sent to you. Even if you didn't opt in for the newsletter when you registered you can still access the latest offers through the messages button. Last is the cashier button. Click it to when you want to make a deposit or withdrawal, redeem a bonus coupon, review your account history or redeem any cash points. Cashier: When you enter the cashier you instantly see the amount available for withdrawal and your comp point total. Click the tab for the action you want to complete. Click the deposit tab to process a deposit, the withdraw tab to initiate a cashout. Use the account history tab to view you deposit, withdrawal and comp point history. Click the withdraw tab to see how much more wagering is required before you can cash out. Click the Redeem Coupon tab and enter the bonus code in the coupon box to claim your free bonus money before making your deposit. Bonus are credited instantly. If you deposit before claiming the bonus it will not be credited until your next deposit. Redeem any comp points using the comp points tab. For every 100 points you can redeem $1 in free bonus money.